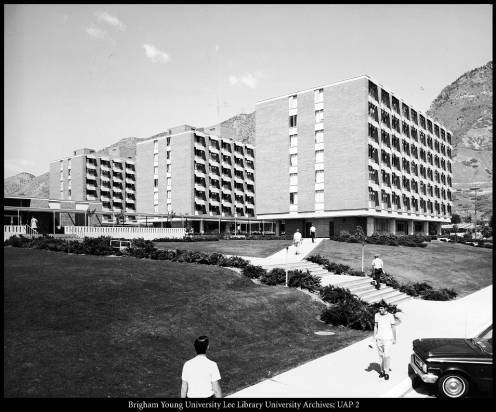 With the increase in enrollment at BYU, the campus needed even more housing to complement the new Heritage Halls and Helaman Halls. Soon, plans were made for the Deseret Towers complex, which would increase the number of rooms available and allow students to live close to campus. However, due to seismic instability, these seven-story buildings were torn down and incorporated in the new Heritage Halls complex when it was remade. By 1962, enrollment had increased by 25% as hundreds of returned missionaries and transfer students swelled the student populations to unprecedented levels. Even with the recent additions of Heritage and Helaman Halls, the rise in the student population would necessitate even more housing units. President Wilkinson arranged for a loan from the LDS church, who owned the school, to pay for the new buildings, and began plans to create a new complex of buildings. The creation of the new buildings led to a serious discussion about the size of the buildings. There were two main proposals: fewer seven-story buildings or more three-story buildings. After studies from the architect, it was determined that the seven-story buildings had more advantages, such as less land used, so that more academic buildings could be made, and shorter walking distances for students. Originally, only four buildings were planned, though a fifth was added soon into the plans. 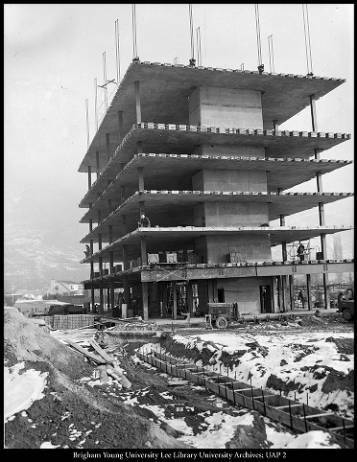 The buildings were made using the lift slab method, were the slabs of concrete were poured on the ground in layers that would make up the separate floors of the completed building. After the concrete set, the layers were raised and separated by hydraulic jacks. This decreased the cost of the building and completed them faster. Completed in 1964, the buildings had all the necessary components for comfortable living of students. There were rooms made for one or two students, each with beds, drawers, mirrors, shelves, and furniture. In the center of each floor was a large shower room and bathrooms. The basements had game rooms and laundry facilities. The roof was planned to be used as a sundeck. The large central building was equipped with a mail room, television rooms, cafeteria rooms, business and meeting rooms, and kitchen areas for the students. There was also parking provided for a small portion of the students. Each hall was named after prominent leaders in LDS history, like Melvin J. Ballard and George Q. Morris, though each hall also had a letter designation, ranging from Q to V. Originally, three of the halls were men’s rooms and the other two were for women, reflecting the gender imbalance at BYU at the time. Despite the many happy memories had by students at Deseret Towers, the nature of the buildings led to some serious problems. During construction, a worker fell off a tall ledge and was seriously injured. In 1981, a student jumped off the seventh floor and died soon after. A few years later, a student was injured when the elevator lost power. He tried to jump out but fell down into the shaft and was seriously injured. This led to the creation of emergency preparedness procedures for the complex and for the rest of campus. In 2005, a group of geology professors at BYU presented to LDS Church President Hinckley about the seismic risk of many of the campus buildings, including Deseret Towers. They pointed out that while the lift-slab technique provided high levels of vertical integrity, earthquakes cause horizontal shift, moving the buildings sideways. 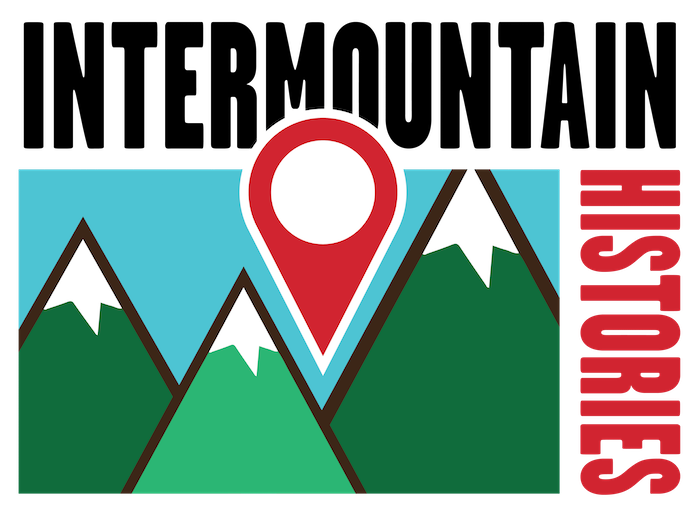 If an earthquake were to strike the Wasatch Front, as many local geologists expect to happen soon, then these towers would be extremely vulnerable. Thus, when Heritage Halls were torn down and rebuilt, Deseret Towers were also torn down, partly to provide more space for larger and better buildings, and partly to avoid the danger of earthquakes. Josh Franzen, Brigham Young University, “Deseret Towers,” Intermountain Histories, accessed April 19, 2019, https://www.intermountainhistories.org/items/show/150. Spilsbury, Laura. “Older Off-campus student housing may have greater earthquake risk,” in The Daily Universe. August 14, 2017. Wu-Lung Chang, Robert B. Smith, Charles M. Meertens, Ron A. Harris. “Contemporary deformation of the Wasatch Fault, Utah, from GPS measurements with implications for interseismic fault behavior and earthquake hazard: Observations and kinematic analysis,” in Journal of Geophysical Research, Vol 111, B11405, 2006.